Most people enthusiastic about gardening long for an attractive lawn. A lush and vibrant lawn is certainly an attractive sight, but achieving such a look is often easier said than done. Whether it’s discoloured patches or areas of weak growth, nothing can be worse to look at in the garden than an unhealthy lawn. Of course, there are many solutions available to address such a problem, but knowing which one works best can become quite difficult. After all, most garden centres and online retailers have endless choices of fertilizers, all of which claim to be the ultimate cure for an ailing lawn. While these products are probably quite effective, they tend to be on the more expensive side, and with so many options available knowing which is the most suitable can is rather overwhelming. Therefore, many gardeners opt for a classic tonic for drab and unhealthy grass. The name of this super-cure? Epsom salt. Now, the idea of putting salt onto grass sounds rather counterintuitive, but it does work. However, Epsom salt isn’t really a type of salt. Rather, it’s the compound known as magnesium sulphate. It certainly looks and feels like salt, but beyond the similar texture they couldn’t be more different. As a naturally occurring compound, Epsom salt is completely safe to use on your grass (unlike table salt!) although people shouldn’t consume it. It’s a wonder mineral for plants mind you! Epsom salts are one of the best natural fertilizers out there for garden lawns. The main reason for this is due to the magnesium present in the compound. Magnesium is vitally important for both lawns and plants, as it not only encourages seed germination but also encouraging nutrient absorption in grass. This means that the lawn becomes more efficient at absorbing vitally important nutrients and minerals such as nitrogen, sulphur, and phosphorus, resulting in grass that is much healthier and greener in colour. So, if your grass is suffering from magnesium deficiency Epsom salt is a natural remedy. These imbalances usually occur naturally and due to nutrient imbalances in either the soil or grass, but the addition of Epsom salts can rectify the issue. Furthermore, the sulphur in Epsom salt stimulates the production of chlorophyll, which helps to increase nutrient efficiency, leading to much greener grass. So, not only are the nutrients being absorbed better, but their nutritional value is much higher when combined with Epsom salts! That’s not all. Other compounds such as iron are present in the salts, which help to promote healthy natural growth. 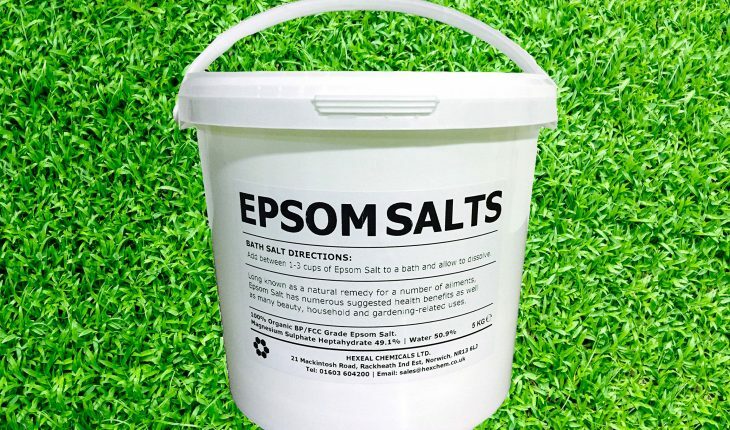 The iron in Epsom salts are absorbed much easier than iron from other sources, making ideal for healthy grass growth. The soil of your lawn may also not be the best pH level for healthy grass. Overly acidic soil is known to hamper the growth of healthy grass, so by adding Epsom salts you can restore a neutral balance to the soil to ensure growth is as healthy as possible. There are a few different ways to apply Epsom salt as a fertilizer. The simplest way is to just throw it directly onto the grass, but be sure that the lawn has been sufficiently watered prior to this. About half a pound of salt should be used for every 10 square meters, and its good idea to use a gardening spreader to apply it. Another method is to combine the salts with water. This is probably the easiest and most effective way to use Epsom salts on grass, so it’s certainly recommended for most. Just add two tablespoons of salt for every gallon of water needed for your lawn. Again, Epsom salts should never be applied to dry grass, so using a water mixture is usually the best route to go for most gardeners. The salts are highly soluble so should be absorbed nicely when watered. Also, it is a good idea to avoid using the salts in the warmest summer months. The main reason for this is that this is the height of weed growing season and the salts will only encourage growth, so it’s best to steer clear during this time unless you want your lawn riddle with weeds! Another great advantage of Epsom salts for garden care is that it’s a natural pest deterrent. This makes it especially great for preventing slugs from eating your flowers and plants – just sprinkle some in the problem areas! Your grass isn’t the only the plant to benefit from Epsom salts either. For instance, roses, peppers, and tomatoes all benefit from the high magnesium content in the slats. As it helps to balance pH levels, the salts are great for older soil high in calcium or potassium and for sandier soils that are more acidic. For instance, by applying Epsom salts to roses, the foliage enjoys a richer colour, while flowering becomes much more vibrant. It also helps the rose to become strong and healthy, resulting in some truly gorgeous roses. Epsom salts can even be used to create a chemical-free weed killer! By combing the salt with water, vinegar and some liquid soap, you can safely remove any unwanted leaves without concerns about toxins and chemicals. Cheap and effective, Epsom salt is a fantastic product to use throughout the garden. There are fewer products out there that work as well as Epsom salts, and its versatility means you can expect to get ample use from it! Read our guide on grass seeds here.